Steve Costa addresses about 30 pickleballers at Fairway Village. The Ocean View Crew pickleball team recently competed in the first match of the Delmarva Team Pickleball League 2018 season, losing only by one game to a strong team from Georgetown, and the Crew edged out the Ocean Pines team from Maryland. But the heck with those pickleball gladiators — let’s talk about people who just want to play pickleball and have fun. Pickleballers below Indian River, like Punxsutawney Phil, are poking their heads out of their houses, and sticking out a wet finger to test temperature and wind. 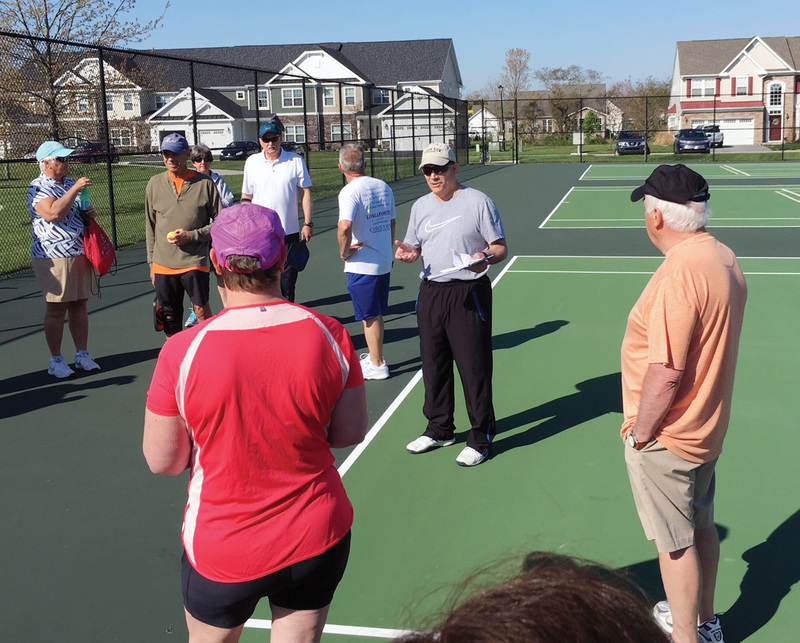 Pickleball courts are being built on the Delmarva Peninsula in communities and small towns few people have even heard of, so I am anticipating a bigger year here than ever. The Coastal Community Pickleball League had their first meeting recently. Steve Costa of Fairway Village and Byron Plumly of Bishops Landing called a working meeting of interested communities. Attending were representatives of Fairway Village, Bishops Landing, Forest Landing, Bear Trap Dunes, Bay Forest, Millville-by-the-Sea, Sea Grass Plantations and Bethany West. They are organizing a fun pickleball format for novices and intermediates at their communities. The Town of Millville’s representative, Steve Maneri, had an emergency but will be involved as well. Bob Gaudreau, another member of the Ocean View Crew, hopes that Bay Colony will join after their May 12 pickleball community clinic. The format — still a work in progress — will likely be where communities gather in good fellowship and play pickleball together, as opposed to against one another. By the time this is published, Fairway Village will already have had a free pickleball clinic for homeowners run by Steve Costa and some of the Ocean View Crew from Fairway Village. Bay Colony is planning one soon, as is Bishop’s Landing and Millville-by-the-Sea. David Lipstein is planning another for Bay Forest this season. Clinics, clinics, clinics? I didn’t know laughter could send so many folks to the clinics! For clarification, the fun league will be for novices and intermediates who have some knowledge of the game. The free clinics they are sponsoring are intended to help people to begin to learn pickleball. Typically, these events are closed to non-community members, but if you would like to participate at one of these, send me an email. I know people! Always the good neighbor, Sea Colony will be hosting this summer their first pickleball tournament, on July 21 at the Sea Colony Tennis Center, for all levels of play. Beginning after Memorial Day, Sea Colony will also be offering pickleball clinics on Monday, Wednesday and Friday from noon to 1:30 p.m. The cost is $28 per session for drop-ins. These clinics would be an ideal follow-up to strengthen your understanding of the game. Call the tennis barn at (302) 539-4488 for details. • The Gold Medal Princess, Pearl Morris, returned to pickleball after a double knee replacement, and 20 of her friends surprised her with a welcome-back birthday party. Give her a hug! • The U.S. Open: My cell phone has been burning up with victory reports about pickleball players winning medals at the U.S. Open in Florida. Charlie Biddle of Sand Castle Realty in Bethany Beach was reporting scores to me and was only a couple points from his own medal this past weekend with his mixed-doubles partner Lynn Casey. Both are members of the Ocean View Crew. Kathy Casey, president of First State Pickleball, and her doubles partner, Karen Gustafson, won gold in their category, as did Jean Burgess and doubles partner Sherry King. Jane Jump and doubles partner Irma Hernandez took bronze in their doubles category, and Marsha McLaurin took silver in women’s singles.